The delightful new installment of the beloved and New York Times bestselling Miss Julia series When Miss Julia's regular doctor goes on vacation with his wife, leaving a replacement in his stead, Miss Julia is immediately concerned. Never one to miss an opportunity to entertain--or size up--a newcomer, she invites the charming Dr. Don Crawford, and his painfully shy wife, Lauren, to dinner. While Miss Julia and Sam both note Lauren's obvious lack of social skills, it's her friends Hazel Marie and Binkie that pick up on some of Dr. Crawford's less palatable qualities. Meanwhile, Lloyd has gotten his first car, and LuAnne, fresh off her divorce, has started a job at the local funeral home and is in urgent need of an occupation-appropriate makeover--Miss Julia has enough on her plate. Yet there is just something she can't place about the Crawfords, and she won't rest until she gets to the bottom of it. 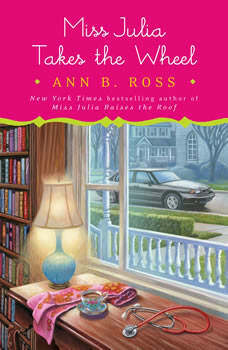 As always, hijinks ensue as Ann B. Ross delivers this delightful and entertaining installment, Miss Julia Takes the Wheel, in her bestselling Miss Julia series.